Looking for scalpels or surgical knives for your research laboratory? 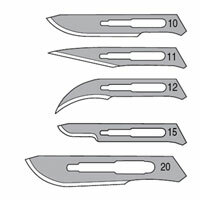 We have disposable knives, sapphire blades, and standard scalpel blades and blade handles. Clear blade increases view of tissue–chemically inert to lymph, blood and disinfectant solutions Our sapphire knives are constructed of single crystal, synthetic sapphires (Al2O3). While not as hard as a diamond, they are still hundreds of times harder that steel razor blades. 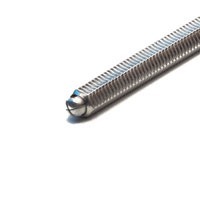 The durability of the blade guarantees a long operational life that exceeds 100 incisions. In addition, the blade and handle can be sterilized using any currently known procedure. The super sharp cutting edge, mirror surface finish and low friction coefficient combine to create an accurate, clean cut with minimal tissue trauma. Scarring is reduced, and incisions heal quickly. Both the stainless steel and titanium handles feature safety locks to protect the super sharp cutting edge from damage and prevent injuries to medical personnel. Handheld sapphire knives are ideal for delicate dissection and microsurgery. Sapphire blades offer several advantages. They are extremely hard, and the edge is honed razor sharp. Because of this, they hold the edge better than standard surgical instruments. They are able to make over 100 incisions. The incisions made with a sapphire blade are much finer that can be made with standard instruments. This leaves less cell damage along the incision. You get an accurate, clean cut with minimal tissue trauma, which speeds healing and reduces scarring. Because these knives are non-metallic, there is no metal ion reactivity. Chemically inert to lymph, blood and disinfectants. The blades of a sapphire knife are clear, allowing you to see the tissue under the knife's edge. If handled properly, a sapphire knife should last for years. Be aware that sapphire hardness also makes the blade brittle. It should be handled with care. Rough handling and dropping can dull the delicate edge. Excessive force can break the tip. Never test the sharpness of a sapphire knife on a finger! The sapphire knife may be cleaned in an ultrasonic bath or wet sterilized as long as it doesn't touch other instruments or solid objects. NOTE: WPI surgical instruments are for laboratory research applications. They are not certified for use on humans. 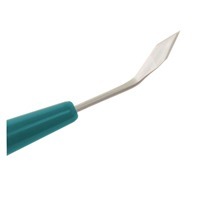 Used for skin incisions Attaching a blade to the handle is easy. Grasp the blade with a needle holder just above the opening of the non-cutting side. Align the groove on the handle with the opening of the blade. Slide the blade into the handle until it clicks into place. Scalpels come in packages of 100 and are individually packaged as sterile units. NOTE: WPI surgical instruments are for laboratory research applications. They are not certified for use on humans. 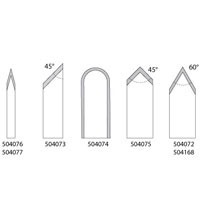 A variety of scalpel handles and razor blade holders are available here. NOTE: WPI surgical instruments are for laboratory research applications. They are not certified for use on humans.